One of my style resolutions this year, well every year actually, is to wear what I own. And if I don’t, to make the ultimate decision to get rid of what I’m not wearing. Even though I have a small closet, wearing what I own is harder than it sounds. Especially if I’ve hit upon a kind of seasonal uniform. A formula that I find myself repeating over and over, reaching for the same kinds of pieces, if not the exact same pieces, because I like them, they look good together, and it’s easier than dreaming up something new to wear. This year I seem to have fallen into a jeans, cashmere turtleneck, Uniqlo down jacket, and scarf rut. Which is okay, I know. There’s nothing wrong with a formula, or a self-styled uniform. It’s just that in my style lethargy I’m ignoring other pieces that don’t conform to the formula, pieces that I paid good money for, and which are languishing in my closet unworn. So… these unworn pieces… should they go or should they stay? And how do I decide? How does one decide when it’s time to say good-bye to one’s clothes? Not ready to say good-bye to these Stuart Weitzman boots. No sirree. I’ve been thinking about that question ever since I wrote a post back in December assessing my wardrobe acquisitions for 2018, and Ann in Missouri commented that her “biggest challenge is ever letting go of anything.” When it comes to those pieces which still speak to us, but which we seldom wear, “How does one say good-bye?” Ann asked. I know that the Marie Kondo preferred method is to dump all your clothes in a huge pile and then tackle the problem. But for me it’s easiest to split up those decisions, making a few at a time. Taking one’s medicine in small doses, so to speak. I do my main closet purge seasonally. When the spring and summer (or fall and winter) clothes come out from hiding, I try everything on and make some decisions. Which pieces will get to have pride of place in my small closet and dresser that season? First the garment has to still fit me. And fit my retired lifestyle. And I have to still love it. If it fits, and I still love it, and am excited to wear it this year, it goes in the “keep” pile. If it fits, and I’d love to wear it, if I had an occasion to wear it, it goes in the “maybe” or the “just in case” pile. I do not believe in the rule: “if you haven’t worn it for a year, you’ll never wear it again.” That’s way too hasty for me. There’s always that one piece that I can’t bear to part with, and which I just know in a couple of seasons I’ll be happy to have hung onto. Like my navy Max Mara pant suit. I keep my “maybe” pieces in a couple of garment bags in Hubby’s closet. “Maybe” or “just in case” pieces have to be good quality, and still fit. Like a certain party dress that I stored because I knew I would wear it again. I bought my Lida Baday dress to wear to the summer wedding of my former student, and now good friend, Erica. It languished for a couple of years, and then last summer I wore it to the wedding of Hubby’s cousin’s daughter. I’ve hung onto this dress because the times when I need to wear a nice dress are few and far between. If I can save myself the trouble of shopping when I already own something I love, then the storage space it uses is well used, in my opinion. I mean, have you tried to shop for a dress lately? They are super hard to find. Of the 12 items shown here in my closet, only 5 were purchased in the past two years. But what happens if the “just in case” pile gets overwhelming? I have a weakness for fall jackets and blazers. I have rarely met a tweed jacket that I did not want to have a meaningful relationship with. Blazers, jeans, and boots… have long been my favourite fall pieces. But the tweed-blazer-as-outer-wear season is very short, some years only a month, here in Canada. September is usually too hot for a jacket, and by November it’s raining and even snowing. When I was still teaching, I wore my fall jackets all winter long. Not any more. They do not slip easily under a heavy winter coat, and are not comfortable unless I plan to take the coat off. Now, let’s enumerate the occasions when I might go somewhere, take off my winter coat, and stay a while. To a party, when a wool blazer is too outdoorsy looking, and neither festive nor casual enough, depending on the party. To a friend’s home for lunch or dinner or book club, when, in my blazer, I might look as if I’m at a business meeting, instead of lounging with a glass of wine and my feet tucked up under me. No, to my mind, wool and tweed jackets need boots and jeans and a loosely swathed scarf to make them look casual enough for my non-working lifestyle. And that means wearing them as outerwear. When my “just in case” pile gets too big, a mini-purge becomes necessary. I usually do culling like this in between seasons. To that end, I did a jacket purge late last fall, and sent three blazers from my “maybe” stash to be consigned. That still leaves three wool blazers hanging in my closet, all of them quite different in style, all old, all in great condition, all still capable of making my fashion heart go pitty pat. I’ll no doubt only wear them during that short fall season, but since they are good quality and meet all my other “keep” requirements, I’m happy to give them closet space. Even if I might wear each of them only once or twice a season. Breathing new life into this old leather jacket. The one fall jacket that I’m determined to wear this winter is this Akris leather jacket, above. 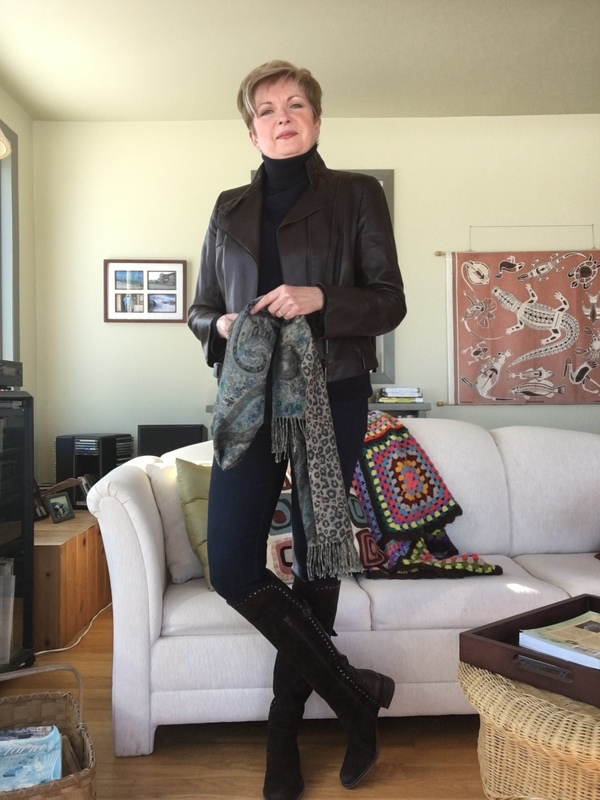 I’d been looking for two or three years for a light leather jacket when I found this one at Holt Renfrew in 2008. I loved (and still love) the slightly moto look, the chocolate brown colour, the buttery soft leather, the understated hardware. It’s much more of an indoor jacket than my tweed ones, and slips easily under a coat. But it’s short, and I haven’t done short for a very long time. So to wear the jacket I need a dress (which I have been looking for) or a suitably loose, long sweater to fall below the hem of the jacket. The other day, when I wore my navy Uniqlo cashmere turtleneck with jeans, these old Stuart Weitzman suede boots, and my down coat, I remember thinking that I should slip on the leather jacket and see how it felt. And actually, it felt wonderful. I love the jacket with this double-faced, wool scarf that has navy and teal on one side, and soft brown animal-print on the other, and my brown suede boots. It makes me smile with satisfaction every year when I see that Stuart Weitzman has issued another version of his high suede boots. I love my boots. They are only appropriate on certain very cold winter days, when there’s not too much slush and salty muck on the streets, but on those days I haul them out, feeling pleased with myself for having made the investment so many years ago. I see myself in this outfit sliding off my big down coat, stashing it in Liz’s dressing room at Nordstrom, then roaming the store looking for that elusive dress, and finally coming back to meet Liz for lunch. Yep. This is exactly what I’ll wear when we do that in a couple of weeks. When I attend a party later this week, at a bar, I’ll wear this outfit then too. Unlike a house party where one has to shed one’s boots and wear indoor shoes, a party in a bar will be the perfect occasion to wear my suede boots and leather jacket. In fact, I think I’ll feel quite spiffy in this get up. 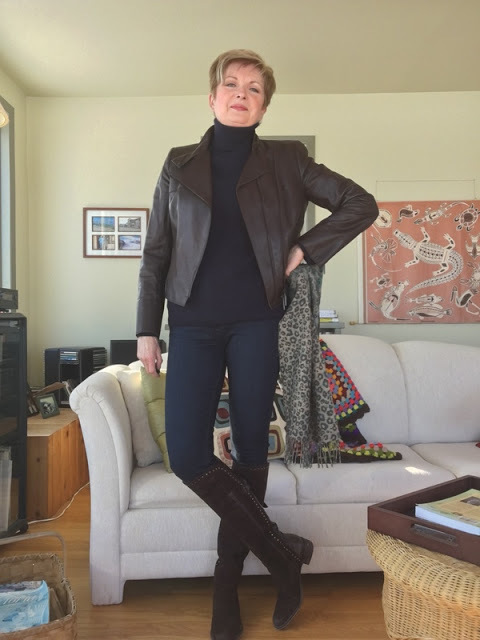 Feeling quite spiffy in leather and suede. Substituting my unworn leather jacket for my all-too-frequently-worn Uniqlo ultra-light down one is a good move. It’s getting too cold for that light down jacket anyway. And I’ve thus justified the continued inclusion of this leather jacket in my closet. I won’t be saying good-bye to this gem just yet. Although next year may be a whole different story. So, I’ve solved my own problem, but I haven’t actually helped answer Ann’s question. How do you say good-bye when a certain piece of clothing still calls out to you? Well, I have some thoughts on that subject, as you might have guessed. If your closet is burgeoning, and you know you need to make a start, somehow, to whittle it down to manageable size, but you can’t face doing your whole wardrobe in one go, why not start with one category of clothing? Do one season, like I do. Or just jackets. Or only jeans and tees. When you do start, be sure to try everything on. Everything. If a piece doesn’t fit, is not in good condition, or doesn’t suit your current lifestyle, then the answer should be obvious. Consign it or donate it. If you don’t love it, do the same. If some pieces don’t suit your current lifestyle, but your life is still in flux, I say hang onto them until things settle down. Making decisions while under stress seems like a recipe for regret. However, if you own a closet full of business wear, and have retired for good, then why not donate most of your suits and dress pants to Dress for Success or some similar organization? Keep one outfit… just in case. You don’t have to get rid of everything at once. 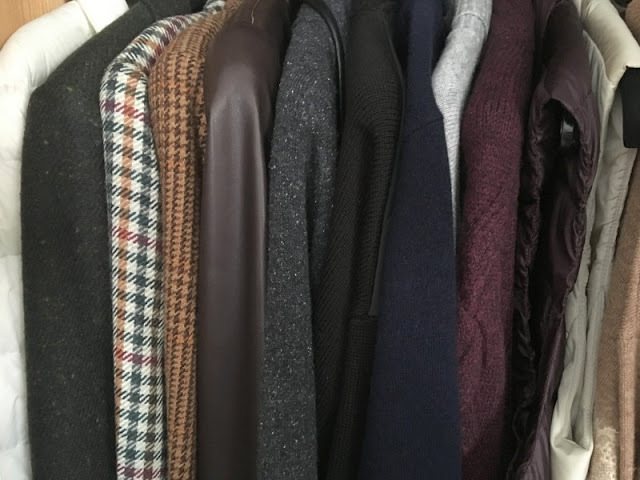 If you have, say, fifteen cashmere turtlenecks, and they all fit, but you rarely wear them because you’ve moved to a warmer climate, choose three that are your favourites to set aside for travel, and consign or donate the rest. But those pieces which you bought on impulse, but have never worn because they’ve never, ever worked with the rest of your wardrobe, be strict with those pieces, my friends. Give up, and get rid of them. And never, ever do that again. Do your research and shop with a list. I’m shaking my finger here. And if you don’t have the courage or the energy to face making all these decisions alone, then call your sister (that’s what my sister does), or a stylish friend who understands your style, bribe them with lunch and a glass of wine, and ask for their help. My sister and I had a wonderful afternoon when I helped her cull her closet. I was strict, though. Sometimes someone has to be bossy, even with someone’s older sister. And when we were done, we both thought it had been worth the effort. It’s a great feeling being able to see everything in your closet, loving each and every piece, and knowing that you could pull out anything and feel wonderful in it. No more guilt about unworn, unloved clothing. It’s all gone to be loved by someone else. Conversely, no more fooling yourself that you don’t need to go shopping because you have “so many clothes already.” After my sister’s closet purge the need to fill empty niches in her wardrobe became patently obvious. So I did. And you can too. A new beginning in the life of your closet. I love that last idea. It was Hubby’s. He’s learned so much about closet culling since he’s been with me. He even instigated a cull of his sock and underwear drawer a few days ago. He was very strict, and we didn’t even have to take any pictures. Ha. Now, I know we’re all different, have different needs, different budgets, different closets… so let’s hear what you have to say, my lovely readers. How do you say good-bye to formerly well-loved pieces in your closet? Or do you? You can tell us. I’m with you, I cull my closet at the beginning of each season. But there is a well worn knit sweater in a storage bin that I hold on to. I just love the blend of soft colours and how they work together. I don’t usually wear those colours and was pleasantly surprised the sweater looked good on me. So it stays as a lesson to stretch myself and look beyond my usual dark colours. I must say, I have finally listened to you…make the list. On my last two vacays I wrote down what I took and what I wore. A very helpful tool. My next list will be for spring shopping and keeping organized! I think you’ll look very hip at the bar in those fab boots and leather coat. Stay warm on the trails! Good for you… you get an A+ for organization, Robin. I'm staying off the trails this week… that -25 or colder windchill, makes me want to stay home and drink tea. I, too, have a fondness for tweed. The oldest item in my closet is a beautiful Harris Tweed jacket that I purchased at least 35 years ago. I haven’t worn it often in recent years; but it is a classic cut, still in good condition, and reminds me of some happy times. I have no plans to ever give it away. I have the same problem with blazers living near Paris, too. The season to wear them is very short if one isn't working, so despite being sorely tempted, they are never on the shopping list these days. Love your leather jacket and boots combo; here's hoping you receive invitations to many bar parties! Regards, Susan. That may be the answer to my jacket problems, I need to go to more bars! First of all, you look great in that outfit. Happy you can still justify the jacket's retention. And the boots! Definitely destined to stay in your footwear hall of fame. I do an ongoing purge of clothing every couple of months so that I am whittling down my wardrobe quite nicely (…now if I could just get my DH to do the same–he seems to be taking over whatever closet/drawer space I clean out; he's the sentimental one). I do retain coats longer than I should, as I tend to wear the same few over the course of the year while others have languished in the closet. Perhaps I will scan the coat closet for donations this week, while folks could still get a few months use out of winter wear. Thanks, Mary. I hardly wore those boots for years since I'd have felt silly with my pants tucked into them at work. Plus they need to be worn with a longer sweater over the jeans IMO. And now I have several sweaters that work. My Hubby is fond of just re-purposing pieces I want to throw out. He'll wear a shirt or pants for a few more years gardening, canoeing, fishing. Ah well… at least it's not out in public, I say. I kept several jackets when I retired, thinking I would wear them with jeans. But some of them were just too worky looking and so I gave them away. Layering of cashmere sweaters… that's necessary with this latest incarnation of the polar vortex. Oh dear, I know there are a few clothes in my wardrobe that I really should say goodbye to, but I never get round to it, or I put them in the charity shop bag only to remove them a few days later, thinking "I quite like that" !! i cull my wardrobe right before the New Year. Things with holes in them – out. I also culled beige and brown and gray from my wardrobe because I am a jewel toned girl! I've culled a whole wack of tops a few years ago in colours I no longer wanted to wear. Some of which I bought for variety when I was working but never actually loved. This resonates, this buying for variety items you didn't ever love — I did the same, and I'm so glad I'm over that (mostly!). More room in the wardrobe (mine is pretty limited anyway) and so much less ambivalence about what I'm wearing. I find I have to be in the very specific “culling” frame of mind otherwise nothing gets discarded….I try to do it at the end of the season and I try to think of the discarded ones being loved/worn by another. I use the same criteria as most : fit, condition, attachment. Periodically I also look at my earthquake ready bag (home and car) and swap out clothes from there as needed. End of season doesn't work for me. I so tired of everything, I'm afraid I'll toss stuff just from boredom. I've never heard of an earthquake-ready bag. Do you live in an area that is susceptible? Vancouver, BC is part of the Pacific Rim of Fire and apparently “overdue” for the Big One. We are supposed to be able to be self sufficient for a minimum of 72hours, hence the 2 (home and car) bags. I don't think I knew that. Wow. I find myself in the position of having to cull a great deal because it does not fit anymore. No jeans left now and trying to find a new pair is very interesting indeed. My favourite style is no longer made by Levis and I am not paying a lot of money for something I only quite like. Today I looked at a jumper and thought: why the hell did I buy you? Offski! But there is a beautiful Thai silk sarong that I bought in the summer of 2000 which I adore, have worn about three times, bring out, put on, put away and cannot bring myself to part with it. If anyone wants it – greeny-gold and dark blue edge – I would happily give it away so it could spark joy for them and less anxiety for me. This sudden cold weather we are having here has reminded me that I have two lovely gilets, one suede, one leather, and they need to be worn for maximum cosy when out on a walk. I am off to get them now. Thanks for the reminder. Maybe you could make the silk sarong into a summer shawl. The one I bought when we were in Tahiti (talk about being influenced by one's surroundings) and have never worn again looks like a huge scarf, but unfortunately it's not silk nor that beautiful. Er…my shawl and scarf collection may well be a case in point…but I am not parting with those. I may have found a home for the skirt on the person of a young friend. If not, I might repurpose it as a very delicate but beautiful pair of cushion covers. Thank you for your idea to keep things if your life is in flux. I am in the midst of retiring (thought I did, but got called back) so I'm not sure what I'll need in a year or two. We also might be moving to a colder climate since the heat and humidity in Florida has never appealed to us. I've felt guilty for keeping things (thank you Kondo fans! ), but as long as it fits, I still like it and I have room the items will stay until we're more settled. No guilt for keeping things… that should be a rule. I was right there with you reading this post. I can't throw out unique items I haven't worn for a year because I know I'll fall in love with them again, so I am an advocate of vacuum-sealable space-bags. They reduce storage space, which is great, but they are also enablers in the negative sense. I also find that the unique treasures I used to find in thrift shops are not showing up as frequently now, either being replaced by fast fashion or bought by resalers, which makes me even more reluctant to get rid of unique pieces. I'll never be a good Kondo pupil. Your approach is great. And you look fabulous!! Ha… bags as enablers, I can totally see it. You should make one of your short films on opening all your bags and having them "explode" across your home. Invent a new syndrome… hoarder denial? Even if half that rack holds clothes that are too small, they aren’t out of style, and again (sigh)… they are too dear to me to give away, for now. Things that are too dear to give away should be set aside until one feels able to do so… I think. Or until one runs out of space, or which ever comes first. I hear you about the blazers. I've finally accepted that I really don't need many (any?) structured blazers in my wardrobe anymore…they just feel too business-y for my current life. 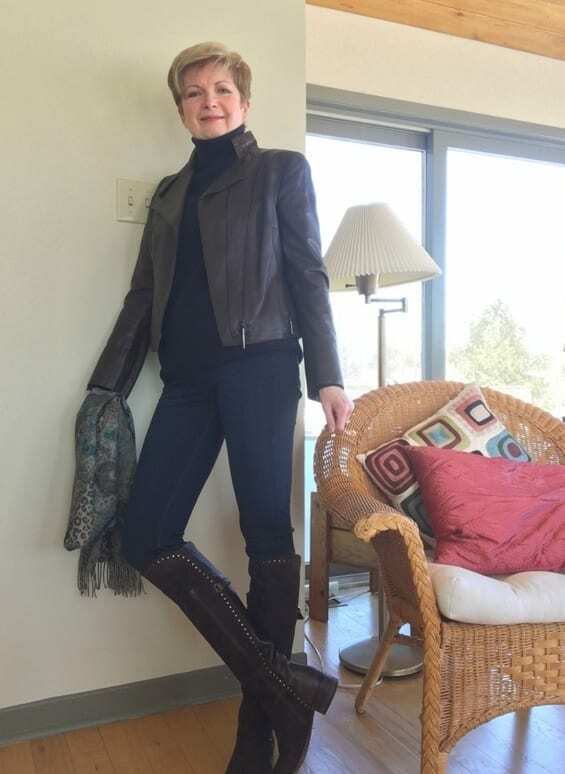 That leather jacket looks fabulous on you, as do the boots! Thanks, Sue. I have parted with quite a few of my structured jackets. But the tweed ones… can't go there yet, if ever. 1. Your comments about the length of each season (months? weeks?) during which one can wear a piece of clothing is a critical attribute, but I'd never thought in those terms before. I've just realized that, for me, "spring" in Missouri barely exists. We have winter, and then we get summer. And most of the traditional spring (April, May) is spent outdoors cleaning up after winter — raking and blowing leaves, mowing fields, trimming forest edges, hauling trash to burn piles — NOT activities that require me to wear anything other than heavy denim overalls, long-sleeved denim shirts, rubber boots. Needless to say, those aren't typical travel months for me, and it's not a time when anyone I know is throwing a big "do," because they're also outdoors cleaning up their properties. So I now see where most of my "Buh bye!" clothes are located. Thank you! P.P.S. You are ROCKING that short leather jacket look! Thanks, Ann. I miss being able to wear spring skirt suits. I used to wear them at work until it became too hot, now that season and the reason for buying them have both disappeared. Even early May here is cool and sometimes cold. Enjoy New Orleans. I'm dying to get away this winter but Stu just had surgery so no travel until our travel health insurance will not be rendered null and void because of his heath not being "stable" as the insurance companies define it. That's ninety days after any change in status or change in medication. So we're relegated to being here in the cold and snow and NOT being able to ski. Lose, lose. Ha. Sue, I'm really sorry to learn that you and Stu are trapped in winter this year with no warmer-weather parole. For Canadians, that's quite a hardship. I also send you and Stu my sincerest, best wishes for his uncomplicated, speedy recovery from surgery. Hugs! Thanks, Ann. He's doing fine. Hard to keep him from shovelling the driveway, though! Ha. I'm a fairly ruthless editor of my clothes, and don't have much emotional /sentimental attachment to them. That said, guilt overtakes me at times, and I punish myself by refusing to get rid of some pieces I never wore but were $$. Ridiculous, I know. I understand the blazer dilemma too. They are probably my favourite thing to buy and wear, but living in Manitoba, my window of opportunity is just like yours. So frustrating. I haven't bought a fall blazer since I retired. Now spring and summer… that's a lightly different story. I find my light spring blazers so versatile, I wear them under my light spring coats when it's still chilly and on their own as outerwear when it gets a bit warmer. I think our season for them is much longer. I do like your husband's idea about the photo file:). Yeah, me too. I thought it was a great idea. That's why I mostly shop by myself. I find I get distracted and listen to other people's opinions which is often a mistake. My first decent closet cull occurred about twenty years ago when a couple of friends gave me a hand with it one afternoon and then helped me transport said culled items to the local charity store after they released me from the chair and ungagged me… OK, that was an exaggeration, but they did threaten me with it a couple of times ! It was mostly stuff that I hadn't worn for some considerable time or had been deemed " never likely to be fashionable again. " We cleaned out about half my wardrobe and drawers and we were all pretty chuffed by out efforts.